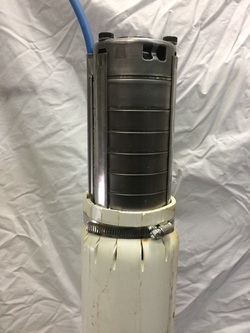 A submersible pump shroud is required to allow the flow of water into the pump inlet to pass across the drive motor to keep it cool. Water may enter the water bore above the pump while the pump is drawing water. This may allow the drive motor to sit in stagnate water while the inflow passes the pump end and is drawn into the pump inlet. This action will not provide adequate cooling for the drive motor. 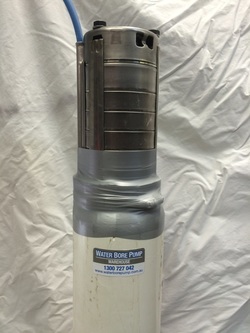 A pump shroud will be required when using a submersible pump in an open body of water like a dam, creek or tank. If the pump to bore casing clearance is not sufficient to fit a shroud, the shroud will not be necessary. ​Cut a length of PVC pipe to match the nominal diameter of the pump assembly and long enough to cover the motor. Cut slots in the PVC approximately 75mm long around one end of the PVC. Fit a hose clamp and gently tighten. ​Gently heat the PVC with hot air gun and increase tension on hose clamp. Continue to tighten the clamp and heat until the PVC neatly fits the pump. ​Re-tension the hose clamp as the assembly cools. Wrap with duct tape to seal the water entry. 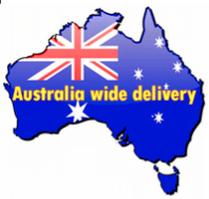 Various types of stilling tubes and shroud adaptors are available from pump manufacturers. 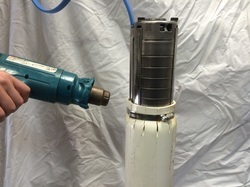 We can fit a pump shroud and make the cable splice connection when you purchase a pump from us.